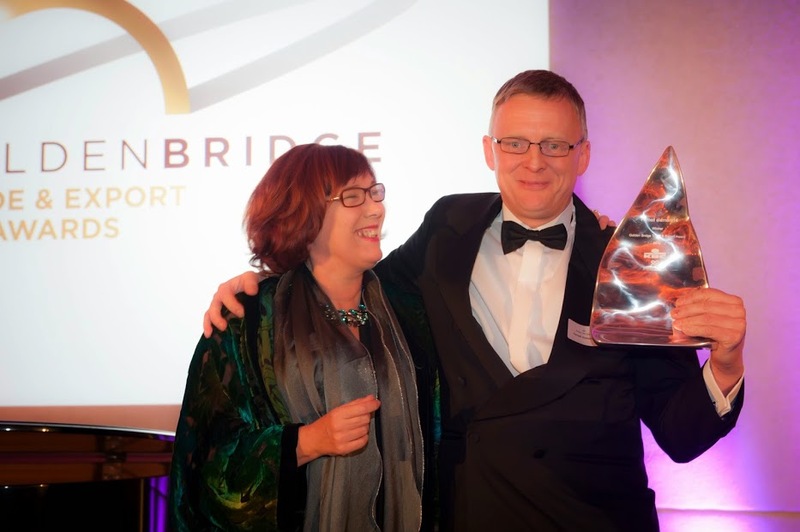 British Chamber President, Glynis Whiting, awarding Farnell element14 with their Golden Bridge award. Belgium is the UK’s 7th largest export market (source: UK Trade & Investment Belgium), whereas Belgium is the 11th biggest investor into the UK. Belgium is not only easily accessible as a neighbouring country to the UK with a somewhat similar way of doing business, it is also a natural first step and pilot market for exporters wanting to make it in the rest of Europe. What these facts perhaps also suggest is that, despite the growth of certain world economies and the challenges of many European ones, the UK-Belgian trade relationship is a strong and sustained one, which continues to contribute to significant business activity across the two countries. Not much resting on laurels there then, which echoes what we notice with the companies who apply for our annual trade and export awards. The Golden Bridge Awards recognise successful UK companies doing business in Belgium, and vice versa. The gala dinner and awards ceremony November is the competition’s natural climax, when winners are announced and all finalists are celebrated in spectacular surroundings in the heart of London. Yet it’s only the tip of the iceberg of what the awards represent. For the companies entering to win a Golden Bridge Award, they have all worked hard in the preceding months and years to build their market position to a level where they could even enter the competition. Their stories are always inspiring and unique, and they are great examples of how trade and export may not be easy, but how these moments of success make it worthwhile facing those ongoing challenges involved (be it before or after their awards win) when doing business abroad. Take Farnell element14, who have overcome labour regulations and transport congestion issues to operate a successful distribution centre from Liege. Or how about Ikaros Solar, who successfully changed its strategy to stay in the market when changes in UK regulation made its hitherto approach redundant. In the coming months, we will feature more of these stories, as well as look at how some of the past winners have developed further since their win, showcasing that successful trade and export is not an endgame. For the organising chambers, much preparation goes into running the Golden Bridge selection process, including the judging panels featuring the countries’ respective ambassadors and of course the culminating awards ceremony. But even after the awards night, we want to make sure that Golden Bridge winners get something out of their win. That’s why on 29 January, the British Chamber and UK Trade & Investment Belgium organised a Winners Day in Brussels, for all recent Golden Bridge recipients from both UK and Belgium. The day commenced at the British Residence with lunch with British Ambassador to Belgium Alison Rose, and was followed by briefings on “How to make most of your awards win” and “How will Quantitative Easing and the Grexit affect your business“. The Winners Day’s diverse agenda was rounded of with the British Chamber’s exclusive President’s Cocktail and subsequent New Year Networking Cocktail, where the winners were recognised amongst more than 100 guests of the British Chamber and the BLCC. Meanwhile, applications were launched for the 2015 Golden Bridge Awards. Further emphasising that, just like most business ventures, the Golden Bridge is not a one-day event once a year, but rather an ongoing programme where we continue to celebrate our past award recipients while also looking for the next business successes worthy of the prestigious title of “Golden Bridge Winner”. Success depends on the ability to take what went well and continue to build and develop that, while tying it in with where you want to be tomorrow and beyond, and what you need to do to make sure you get there. Successful business and trade does not slow down or stop to reminisce about past feats. Equally so for the Golden Bridge Awards, which is why we have decided to already now open up for applications and partnerships for the 2015 awards, to ensure this year will be even better than the past ones. Let me know if you would like to get involved: james.pearson@britishchamber.be.